ANSA EAP’s operations team (or secretariat) recently set for itself the task of influencing policy-making in the region towards the adoption of social accountability (SAc) as an approach to good governance. This is, of course, just one among several strategic objectives that the secretariat has identified for the next three years of the network’s life (dubbed earlier as its “consolidation phase”). So, by 2016, the regional hub dreams of becoming a recognized “think tank” for SAc-related policy issues in this part of the globe. Dream big or dream bigger, otherwise don’t dream at all, right? Still intoxicated by the outputs from that strategic planning session, and titillated by this new role as the network’s research lead, I went through the process of creating a mind map for the research cluster’s strategy for 2013. The center box indicates what should be a more modest target for the year, and the surrounding boxes show the things that need to be done to reach this objective. Then there are the yellow boxes, which point to next year’s agenda. As with most visual representation of strategies or plans, the mind map looked good. And that’s where the initial problem with such diagrams comes in: they tend to give people the impression that the plans or strategies are almost seamless, and their implementation even smoother. Nothing could be farther from the truth. 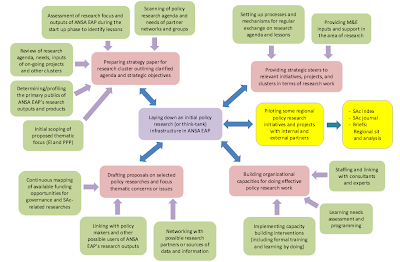 The research cluster’s strategy map, in fact, is bound to lead to more questions than to solid answers. Right off the bat are questions about the nature of policy research for SAc, which, therefore, have something to do with setting our regional research agenda. What kinds of subject matter are covered by such an inquiry? Or, what could be our main objectives or goals in pursuing this type of research? Interestingly, an immediate response that I always get from colleagues is that such studies will have to support or give credence to policies that create a more enabling environment for SAc practice. Policies on full disclosure of government documents and citizen access to information come to mind, as well as those that provide for citizen participation in planning and budgeting, and citizen monitoring in the implementation of government projects. Perhaps related to this type of policy studies are those researches that help prop up so-called “governance indices”, which attempt to measure and assign numerical values to certain aspects of the governance context. These act as a kind of barometer for governance quality, and a useful advocacy tool at that. And since SAc – capable citizen groups engaging constructively with government to monitor its performance – helps to improve governance quality, development of a “SAc index” is not that far off from the sights of some SAc practitioners and network partners. An entirely different set of policy researches could involve looking at those adoption questions or concerns that stakeholders, including decision-makers and power holders, commonly raise during orientations on SAc: how long does it take to go through a particular citizen monitoring process; how much does it cost to use a specific SAc tool; how does this total compare with the value of supposed benefits from such strategies in participatory governance; how to proceed in initiating SAc given local conditions (e.g., polarization among officials); and so on. As an example of this type of policy research, I would like to cite here this very impressive 2011 Oxford University impact study of World Vision’s Citizen Voice and Action (CVA) approach in Uganda. CVA brings together some SAc methodologies like civic education, community scorecard, social audit, and interface meetings with local officials. The Oxford study was able to link the CVA approach to specific changes in development outcomes (e.g., student performance in tests, pupil attendance, etc.) and even peg an individual cost for the intervention. Perhaps a subset of such type of researches could be those that explore the application of SAc tools and approaches in particular thematic areas or public governance relationships. For example, in the extractive industries sector, such studies could look into existing models or experiences in using performance scorecards as an instrument for multistakeholder monitoring of private mining companies. Very similar to this is the International Financial Corporation (IFC) material on participatory monitoring and evaluation of the impact of extractive industry projects. There could be more ways of expanding this typology. I can already imagine some ANSA-EAP colleagues reminding me to stick to a regional focus in deciding on the type of policy research to pursue. Well, it’s not that simple. While some of these studies would have to look at specific country experiences and contexts, many could very well involve a more regional approach or scope, allowing for comparisons as well as drawing out of some general lessons. So, I guess the thinking continues. And we haven’t even begun to tackle the demand-side of our diagram (e.g., Who will be interested in our findings and research outputs? Should we really be targeting policy makers as our users? ), or those branches that deal with logistical and capacity concerns (e.g., Where are we going to get the resources to support such studies? What knowledge and skills would be required of us?). But I believe these should be topics for my next blog posts. Randee Cabaces is ANSA-EAP’s Research Manager and a dedicated learning facilitator for social accountability and good governance.